As plant 2017 is nearing some parts of North Dakota, I am continuing to cover some pre-plant decisions that are being made. For at least the next two articles I want to discuss fertility. There is quite a lot to maintaining proper fertility for corn as the crop is a high user of many nutrients, so I will not be discussing all pertinent nutrients or aspects of the nutrients discussed. This week I want to focus on the nutrient we hear and talk most about in corn – Nitrogen (N). There is no shortage of research that has been done with nitrogen by researchers, so producers have a strong starting point in today’s production systems. At North Dakota State University, Dr. Dave Franzen has worked extensively with nitrogen in corn. As an extension soil specialist, he has put his research to work for producers by making easy to use, effective, tools for calculating nitrogen rates. 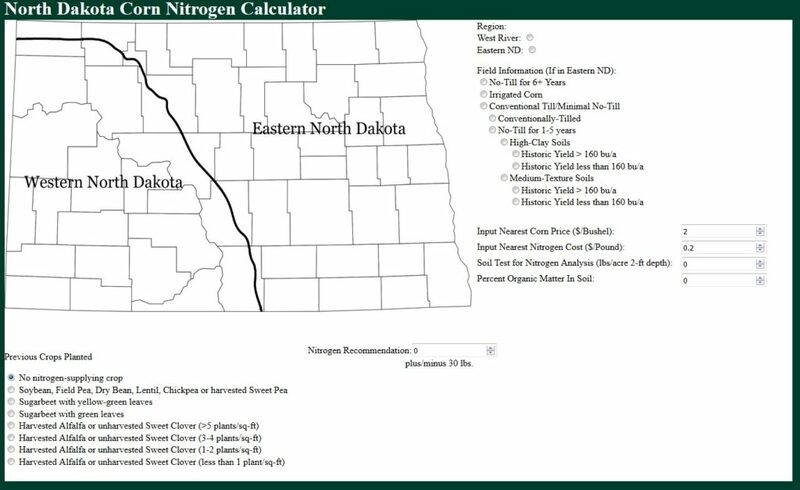 One such tool is the Nitrogen Calculator (available: https://www.ndsu.edu/pubweb/soils/corn/) that takes into consideration many important production factors to accurately come to a recommended N fertility rate. After using this tool for your operation, be wise to remember that Dr. Franzen recommends adjusting up or down by as much as 30 lbs N per acre using ‘common sense’ and ‘boots on the ground’ observations. There is detailed research in many aspects of nitrogen fertility in North Dakota, such as the many aspects of timing, placement, rate, soil type, and source. Much of this research has been funded by the NDCUC and put towards improved nitrogen recommendations in ND. A few outstanding tips stick out to me amongst all that could be discussed under these diverse aspects of corn nitrogen fertility. The first would be pay close attention to nitrogen losses at the time of application and during the season. If you are worried about losses at the time of application, consider your placement and incorporation of the fertilizer. Additionally, there are products such as urease inhibitors and nitrification inhibitors, and slow release coatings, which in short provide a longer window of nitrogen being in a desirable chemical form in the soil, and are generally known as extenders and additives. If you want to really increase your knowledge about extenders and additives I encourage you to read more here: https://www.ndsu.edu/fileadmin/soils/pdfs/Nitrogen_Extenders_and_Additive_for_Field_Crops_2017.pdf. A final thought about nitrogen losses is to consider your side and topdress N options. To quote a neat way to look at thinking about the need for sidedressing, I will use a third bit of information from Dr. Franzen found in his corn nitrogen calculator: “High clay soils are subject to N loss due to denitrification in wet years. If spring rainfall is normal and the soil is muddy for less than 10 days, the preplant N recommendation should be sufficient for high yield. If rains result in muddy conditions for more than 10 days, supplemental N as sidedress is strongly recommended. Estimate 1.5% nitrate-N loss per muddy day.” I like how he provides a simple rule of thumb as to keep track of the muddy days on your fields. To conclude this discussion about nitrogen, I will first say that many researchers entire research carries are on N fertility. Consequentially, this article is just a way to continue the N narrative and is far from conclusive. It is too early to tell if we will be in a droughty, excess moisture, or sweet spot rain cycle for the 2017 growing season. The best we can do now is apply the proper amount at pre-plant, stick to our nitrogen fertility plans, and adapt our plans as the weather makes us.